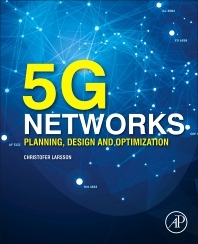 5G Networks: Planning, Design and Optimization presents practical methods and algorithms for the design of 5G Networks, covering issues ranging from network resilience to how Big Data analytics can used in network design optimization. The book addresses 5G optimization issues that are data driven, high dimensional and clustered. This book will be an invaluable resource for telecom operators and service providers, university researchers, graduate students and network planners interested in practical methods for optimizing networks for large performance improvements and cost savings. Christofer Larsson works as an independent researcher and consultant in network design traffic engineering, network performance evaluation and optimization. Wavelet analysis and simulation of self-similar traffic. Christofer Larsson is a consultant in network design and traffic engineering, having worked for Ericsson for a decade. He holds an MSc in Engineering Physics from the Royal Institute of Technology, Stockholm, Sweden. Relevant design and planning 5G considerations are examined. Solutions to related challenges are presented with the scientific depth they require.